The Stormclan is few in members but strong. Their leader, on the other hand, well, could do with a few more lessons. There are 2 other clans in the forest: Echoclan and Mapleclan. We have survived many harsh 'storms' earning us our name. We have special powers; some stronger than others. We have many more harsh things to defeat before peace falls upon our forest, but we will rise to face them. We will survive! We are strong! Looks: small cat with pale gray fur and darker gray swirls. The tips of his ears are black and his tail tip is white. His front paws are black and his muzzle is too. His fur a short and his back legs are white. Nine Lives (This only applies to leaders): 8 left. You can only have up to 3 main characters per user. Power(s): Walks freely in starclan and darkforest. Other: Her eyes change depending on her mood; like fire. Her ability comes in handy when solving/receiving prophecies. She wants to become stronger. History: She once had a mate, obviously. He joined the stars bravely by saving an apprentice from drowning and being dragged under by the current once he got the apprentice to shore. She was pregnant when he did die. Moons later her kits were born but they were to frail when a large storm came. The coldness ended up giving them green-cough and at their state, ended off dying. She lives with grief now after losing her loved ones. I will be adding another. Obviously the solid cat is Nightstorm while the other will be Hollowshade. Power(s): He can see/communicate the cats who have passed away and haven't descended. Other: He sometimes trains with these cats because some of them are forgotten warriors. Hollowshade is typically considered Nightstorm's shadow; in which he allows without knowing his true intentions. History: He began to see these cats when he was an apprentice. He refused to speak about it though. Through his foolery he ended up being so caught up in training with his mentor and his spirit mentor that he never spent time with his father before he died from a falling tree. Nightpaw fell into despair for his foolery and began training even harder with his spirit mentor. He soon accepted his spirit mentor, who dwelled under the name Hollowshade, as his official trainer. 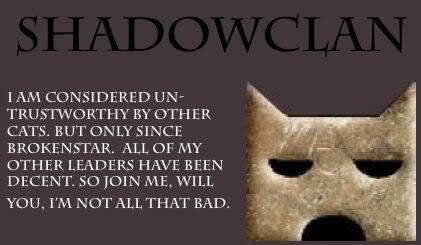 Hollowshade helped him become the best warrior and is still today training him as his shadow. Personality: Quiet, sweet, kind, fierce, deadly, and protective. She is quiet because she hasn't had anyone to speak to for a while and must regain speech when she joins the clan. She is very sweet and kind. Just by watching her loners die to protect her, she decided she would do the same for the cats of Stormclan. She will become fierce and deadly when something harms/kills a member; this is also where her protective side kicks in. She can and will take a hit for anyone, even if she isn't a big fan of the cat. 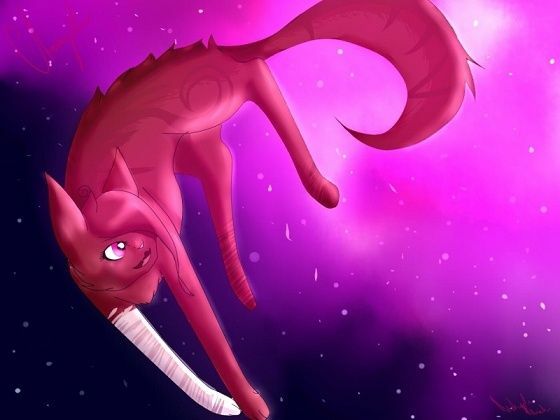 If you guys wish to know my search it's 'Starclan Cat SAI' and I found it in related images of a picture. Though I can say this art belongs to Riverspirit456. 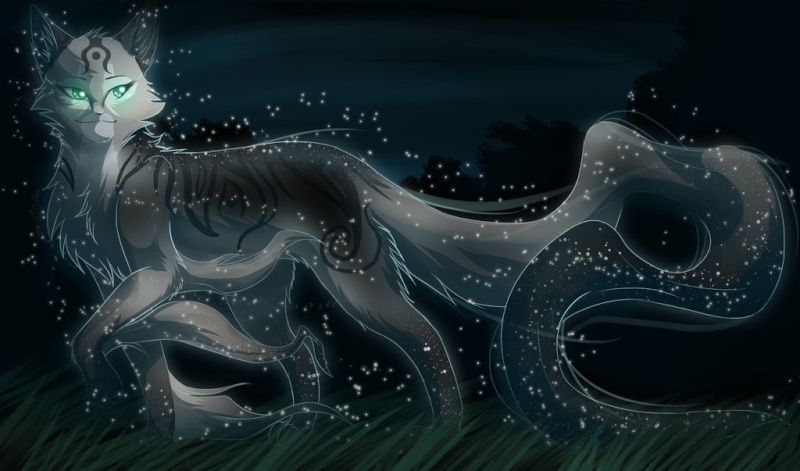 I can also say that me and Fawnstar share a similar interest in Riverspirit since hers is a work of her as well. Way to go. I have no idea who the owner is but the design belongs to the original owner. Power(s): She has the capability to shift into stars, like a starclan cat, in which makes her invincible, but she can still harm others. 1. Her ability randomly acts up. 4. Her pelt look likes the picture above when she is in star form. Just cut out the flowy tail an stars, there you have her natural self. 5. At night her fur has the tendency to absorb the stars light, and give out their own light. Making her sparkle like stars. 7. She has a bright spirit and never loses hope. 8. She can and will shift between star and solid when someone she cares for deeply is injured. 9. Dreams of becoming leader. Knowing that is inevitable she also dreams of protecting her new home until her death. She was born in a harshest time of winter. At birth a group of loners came across her and her family. At the time her tail seemed to be like a wisp of moving stars. Intrigued by her tail they took her with them. The group of loners that found seemed to have extra ordinary abilities like her as well. She fit in there, even if her real family wasn't there. Time flew by slowly and by the next winter, her new family was lost. They were all unprepared for the blizzard. Half of them starved to death while the others froze. She was almost to die from starvation when Flint, the deputy, walked into the den with a scrawny rabbit. Obviously it was crow-food, either way, it was only enough for one big cat, so the rabbit was given to Galaxy. She didn't eat it all and the rest was saved for the next time. The loners wanted her to live because they claimed that her skill was rare- never before seen. The blizzard lasted a total of three suns. Four cats of the group didn't die; Flint, Galaxy, Bramble, and Flicker. They first buried their lost members, then proceed to find food. Very little was found and Flint passed away with his mate Flicker by his side. Bramble and Galaxy buried their comrades before leaving the area in search for food. They found a scrawny crow which they shared. Soon enough Bramble received frostbite over night and died with a last wish. "P-please. Please don't take Galaxy away. S-she must survive." Her final breath was at night. Galaxy found out her death in the morning. She lacked the strength to bury her last friend. Instead and ran around the woods picking branches with little leaves and stray herbs and flowers. She covered her comrade with the found supplies before beginning her track- growing weaker and weaker every day. She would look up to the sky and she would know, Spring is near. or something like that to indicate that you would like it. also we just need 1 or 2 more characters and at least 1 other person then we can start. 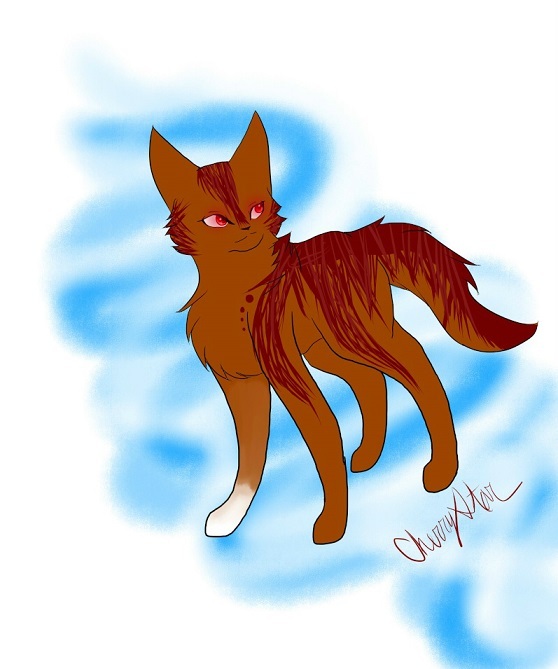 History: was born on the night of the Great Firestorm which nearly wiped out Stormclan, giving him his name. his mother thought that there were already enough 'Fire's so she named him Blazekit. ~sorry but no, Dragonwing, I am going to give Deputy to someone else. But if no one else asks for deputy by tomorrow, then yes, you may be deputy. But not right now. Also we just need at least 2 more characters: one as leader for Echoclan and one as leader for Mapleclan. Anyone is welcome to join at almost anytime. Personality: Smart, deadly, a cat you don't want to be enemies with, cares for his cats, good humored. History: he is the 2nd Echoclan leader. ~yes, Jayfang you may be leader of Echoclan. Also, good idea; i will do that. Special Ability: She can teleport, really fast if wanted to, leaving red leaves or thorns behind. Other: 1. Main antagonist I guess. 2. When she is completely enraged and teleporting, her head, back and tail become fire. 4. 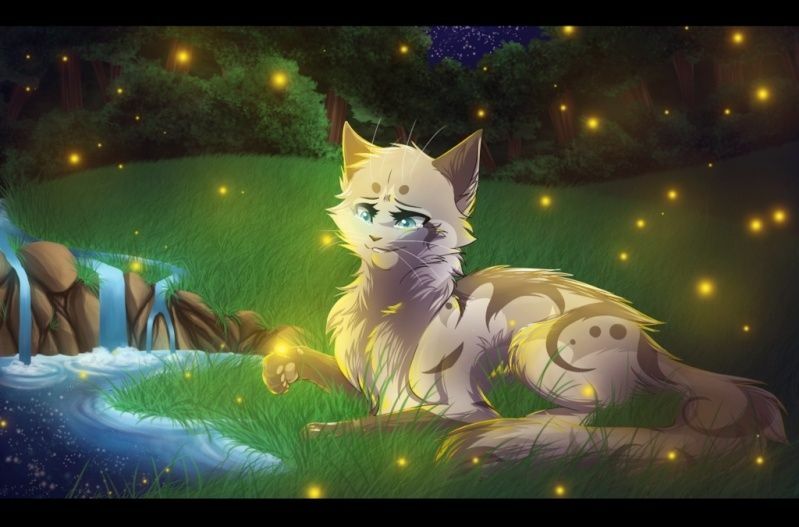 Believes that there is no Starclan and hope left for her. 5. No cat wants to get on her bad side. History: She was born to Mapleclan. She was actually the opposite of her personality now in the past. When she was deputy/warriorshe fell in love with an Echoclan cat name Rowanblaze. She was foolish enough to avoid killing him during a war. Because of that Rowanblaze killed her mother. In fury she unlocked her ability and slaughtered Rowanshadow. That basically a short summary. I know I used I burn for Galaxy but it also suits Redstar. Personality: Fierce, deadly, strict, alert, emotional, cold, rude-humored. 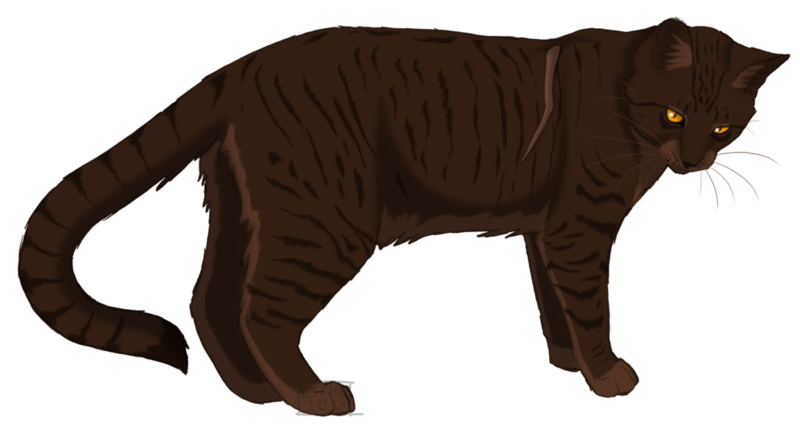 History: Used to be a warrior of Stormclan but joined Mapleclan after his clanmates were blaming him for his mother's mistakes. Personality: Kind, Smart, fierce, sometimes prefers to use words instead of claws. Special Ability: Can blend in with the enviroment easily, taking in the scent of her surroundings, making it difficult to scent her. Other: The picture you saw is what she looks like when using her special ability. Just cut out the stars and the glow, add a bit more blue-gray to her pelt, and add some sky blue to her eyes and there you have her normal self. History: Her father died under the paws of a monster, drawn out by a rogue he was chasing out to defend his territory. The rogue's name was Jack and had given Echoclan much trouble, until Stardust, out seeking revenge, tracked him down and killed him, chasing him out onto the Thunderpath, sending him to the same death as Stardust's father. ~Dragonwing you may be deputy of Mapleclan if it is all right with Vinyl. ~Okay so as soon as a couple of people confirm somethings, we will begin. ~That's fine by me; you can be deputy. ~okay, as soon as Vinyl approves wether or not she wants Drago (Flameclaw) as her deputy, we shall start! oh and just so y'all know: yes, Vinyl, you can and may be leader of Mapleclan. ~just wondering but, when are we going to start? ~im working on it now. Im sprucing it up so it will take awhile. I promise to try my hardest to get it done by next weekend; im quite busy. Im adding something to make it a bit more interesting. 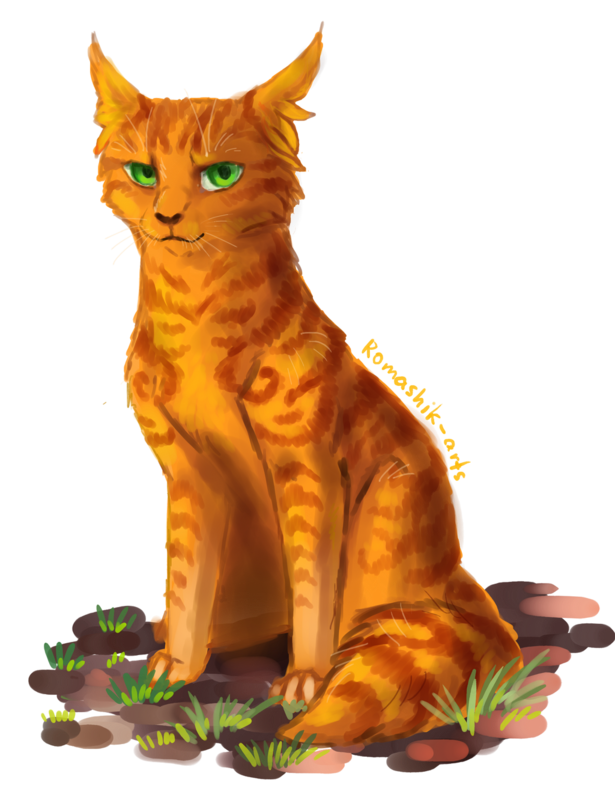 ~Oh and congrats on becoming ThunderClan Deputy, Dragonwing. ~~Iceshard, I am here to enforce the rules, not to join the rp. Do not double post (on the same topic, twice in a row). It is a new rule created recently, so I'll let this one slide. For future reference though, dont do it again. If you need to say something more, then edit your last post on the topic. ~Okay so I'm gonna try as hard as i can, but it might be a bit crappy. Here goes nothin. ~Also, Drago (Blazefang) is just temporary deputy until someone takes the spot. If by November 30 no one else has asked to be deputy, then Drago (Blazefang) will become the permanent deputy and (in the story) Stormclan will have to except that their previous deputy is gone (kinda like with Graystripe but the deputy doesnt come back this time). ~I got permission from Drago to use Blazefang and Drago made Blazefang's looks. And Jayfang made Duskstar's looks. Jaystar shivered in the bitter leaf-bare cold. It nipped at his ears and tail tip, so cold he thought he would get frostbite. "Crowflame!" called Blazefang, who was his temporary deputy until his official one came back. "Would you please lead a border patrol over by the Echoclan border?" "Sure thing Blazefang." she replied. "Who shall I take with me?" "Take two other cats with you; it doesn't matter who." She nodded and called to Frostpaw, her apprentice, and Littletooth, a black and white tabby tom. Jaystar winced when he saw the long scar running across Littletooth's flank. The recent conflict between Stormclan and Mapleclan had led to a battle that hadn't ended well. 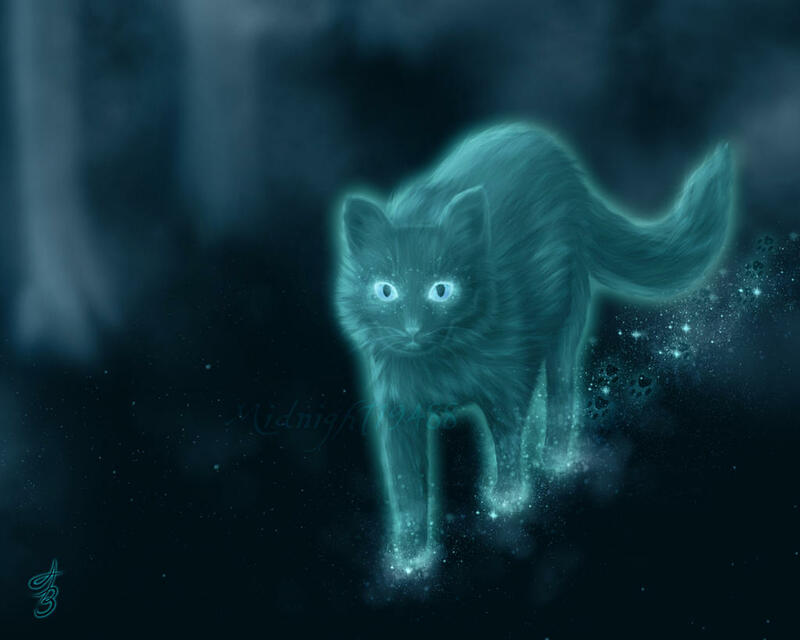 The battle had taken Silverfrost, Shadestorm, and Fallenpaw, sent Shiningheart to the elder's den because of a wound that refused to heal, and taken one of Redstar's lives. Was it all worth it? Jaystar wondered. All the death and bloodshed, and over what? Prey? Territory? Loyalty? He sighed and shook his head. All this wondering was getting him nowhere. He padded up beside Blazefang, sitting down beside him. "Prey has refused to show itself." mewed Blazefang. "I hope that this harsh leaf-bare ends soon." Jaystar nodded in agreement. "The conflict with Mapleclan hasn't helped. We lost so much, and for what? Prey? Territory? Loyalty?" Jaystar sighed wearily, wondering what would happen next. "At least Fireclan had been sympathetic towards us," he murmured. 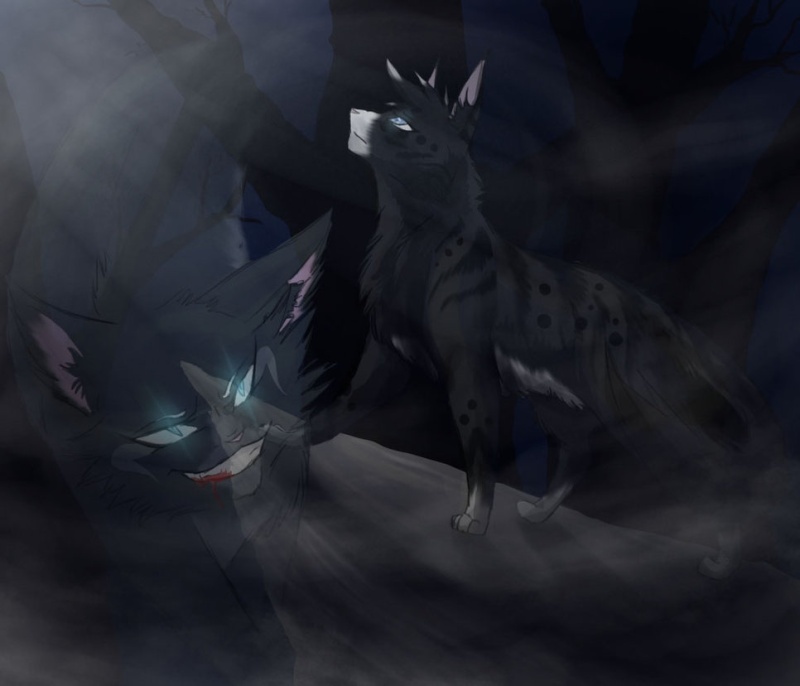 "Before Echoclan and Mapleclan refused to help when the Twolegs took over their territory. They had said, 'There was always only three trees at the Three Trees, so it must mean that there are supposed to be three clans.' Slatestar was always on our side. I wish none of that nonsense had happened." "Feeling a bit nostolgic, eh?" meowed Blazefang, amusement glittering in his amber eyes. "Well, we couldn't take them all in." He glanced over at a white-and-gray tabby she-cat suckling two tiny kits. "But Mistyflame has been settling in well." "Yes, I suppose." muttered Jaystar. "I wonder how Slatestar is doing. He must miss his mate and kits." As he was padding towards Mistyflame's den, Starlingkit tumbled out, quickly followed by her brother, Treekit. Jaystar quickly side-stepped to avoid being tripped by the two wrestling kits and watched, twitching his whiskers in amusement. "They will be great fighters," he mewed to Mistyflame. "You're lucky to have such great kits." "If only Slatestar could see them," Mistyflame rasped. "He would have loved them." "I'm sure he loves them anyways." Jaystar dipped his head and padded towards the entrance. "Where are you going?" asked Snaketail, who was guarding the entrance. "Just for a little walk." Jaystar replied. "Okay, then," meowed Snaketail. "Watch out for Mapleclan." "I will." Jaystar called and padded off. Stardust padded along the Stormclan border, marking it as she went along. She tasted the air for any sign that they may have crossed, but found none. "Have any Stormclan cats invaded?" asked Clawpaw. "I'll shred them!" "No, you won't," Stardust retorted. 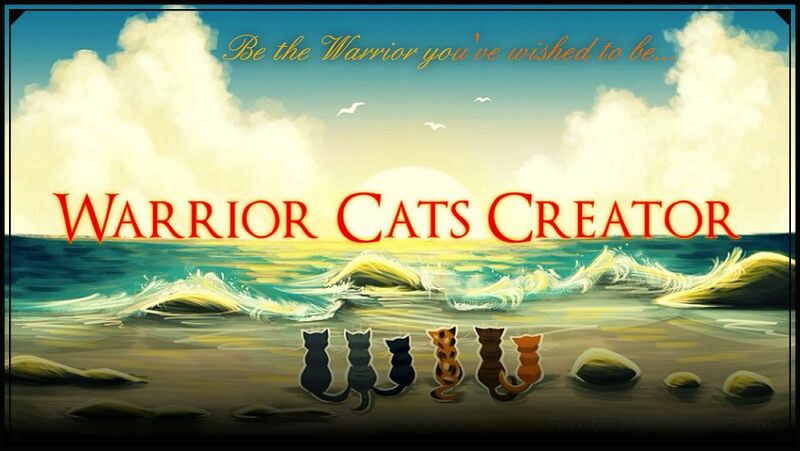 "No Stormclan cats have invaded." "Oh," meowed Clawpaw, looking disapointed. "Okay then." "Stardust!" called Clawpaw's mentor, Sunstripe. "Come over here and look at this. Clawpaw too." he added. "What is it?" mewed Stardust. "Stormclan?" "No," he replied. "Not Stormclan, Mapleclan." "Mapleclan? I thought they were our allies." murmured Clawpaw. "Obviously not." retorted Sunstripe. They peaked around the bush and saw a rabbit, freshly killed, and drenched in Mapleclan stench. "Never trust a clan other than the one you belong to." growled Stardust. "How dare they cross the border!" snarled Clawpaw. "And try to steal prey." Sunstripe agreed. "They must of heard us coming and ran off." "This needs to be reported to Duskstar, immediately!" Stardust meowed, heading back towards camp. "We will not except any trespassing whatsoever!" As they headed back towards their camp, Jaystar backed out of the bush he was crouching in, and arched his back in a long stretch. "Ah," he sighed. "That was interesting to watch." He padded over to where he had left his rabbit covered in Mapleclan stench. He let a little mrrow of laughter and picked up his rabbit, dragging it back to camp. "I can't believe they didn't see this rabbit." Jaystar murmured around the rabbit. "They only saw the one right outside the bush. They're as blind as a mole." He let out another little snort of laughter and padded off towards camp in silence. Personality: Friendly but can be anti-social at times. Power(s): Other than having better hearing and eyesight than almost any cat and the ability to move faster as well. Other: LOOK AT HIS ORIGINAL CHARACTER CODE! Hunger clawed at the silver she-cat stomach. With every step on the lush forest floor, her limps grew weaker and weaker. The diamond eyes she once held were now plain, lifeless slates of turquoise stone. She starred at the ground with every move, only lifting her head ever so slightly. With a low hanging head she lightly walked into a tree. She turned around slowly and raised a paw, only for a loose root to catch her ankle. Gravity over came the young she-cat and within seconds she was laying in the lush green. "Hehe, sorry Bramble... Flint, Flicker... Seems I won't be able to carry the name, Starlight Fighters anymore. Sooner or later... you guys will come for me and I will join you as a Star Wanderer." She let out a weak sigh and closed her eyes. "I'm sorry." She murmured as the three cats flashed through her mind. With a twisted paw and weak limbs, she refused to move and instead rest. She would brush her thin, dull tail across her side, feeling the outlines of her rib cage. Her eyes shot wide as she remembered Bramble's final wish. She pulled her paw out from under the root and pulled her self up on all fours. She stood there, her legs trembling beneath her before she collapsed back to the ground. I'm just a weak kit... But I wanna... No I got to live! Flicker, Flint, Bramble. I will carry our name!She dug her claws into the Earth and pushed herself back up, defying the gravity that continued its frivolous attempt to push her down. Redstar sat in her cold, dark den. Moss covered the entrance so very little light could seep in. She has been enclosed in her den for over two suns since her lost life. "Huh, dying in a fight... How pathetic." She spat and stood up. The nest she laid in grew dry and irritating. She clawed at the next, tearing it to shreads. She raised a paw and looked at it. She let out a tsk and moved towards the wall. There was a small stalagmite that peeked out from the floor close to the wall. She began running her claws around the round stone, sharpening her claws. Once done with her job she looked at the entrance. The dappled she cat walked through the mossy into the blazing sun. She stood there, letting her golden eyes adjust to the blinding rays. She looked around the camp before slowly making her way towards the watering hole.